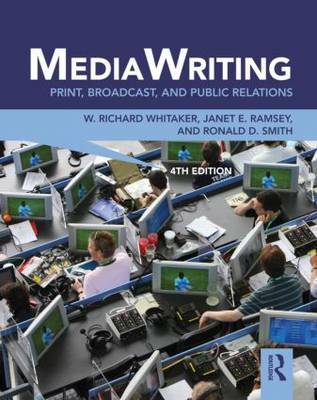 Author(s) Whitaker, W. Richard; Smith, Ronald D. ; Ramsey, Janet E.
MediaWriting is an introductory, hands-on textbook for students preparing to write in the current multimedia environment. Rather than just talk about the differences among the styles of print, broadcast, and public relations, MediaWriting sythensizes and integrates them, while weaving in basic principles of Internet writing and social media reporting. Complete with real-world examples, practical writing exercises, and tips and information for entering into the profession, MediaWriting continues to give students the tools they need to become a successful media writer. The new edition has been extensively rewritten to reflect the dynamic nature of the profession, paying significant attention to how the Internet and social media have become essential communication tools for print and broadcast journalists, and public relations professionals. In addition to new multimedia elements, the fourth edition’s companion website features enhanced resources for both students and instructors, including chapter overviews, writing tips, a test bank, sample critiques, and a sample syllabus.